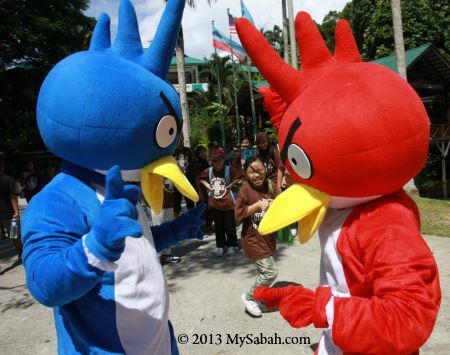 Angry Bird is the most popular “bird” in the world now, but people will forget it soon. 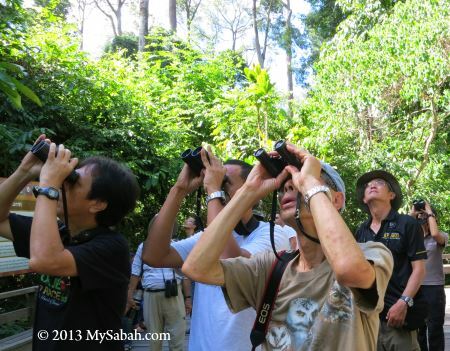 Out of 660 bird species in Borneo, do you know which one is the most wanted bird by bird watchers? It’s Bornean Bristlehead (Species: Pityriasis gymnocephala), which is endemic to Borneo. 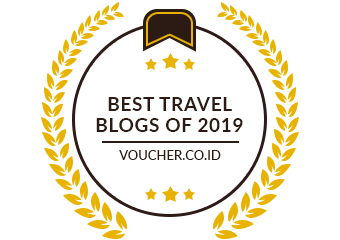 It is so special that it should take over hornbill as the most iconic bird of Borneo. 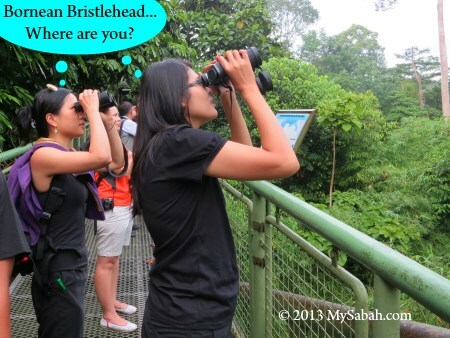 Birders from all over the world consider Bornean Bristlehead a trophy bird and pay thousand$ just to see it. 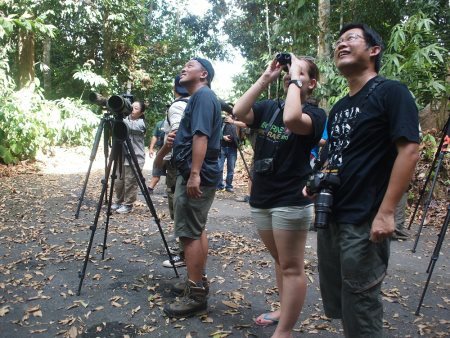 In Borneo Bird Festival last month, foreign birders, who visited the festival, took the opportunity to look for this bird near the event site, i.e. Rainforest Discovery Centre (RDC) in Sepilok of Sandakan, one of the most promising places where Bornean Bristlehead shows up frequently. Bornean Bristlehead is classified as a Near Threatened rare bird species. Some people catch it and sell it as a pet bird in black market (of course it is illegal). This bird lives in rainforest from lowland to 1,200 Metres asl. It is usually seen foraging in flocks of 5 to 10 in the middle and upper canopy, generally feeding on insects. What makes Bornean Bristlehead so unique is – it is the sole representative of the family Pityriasis (scientific grouping). 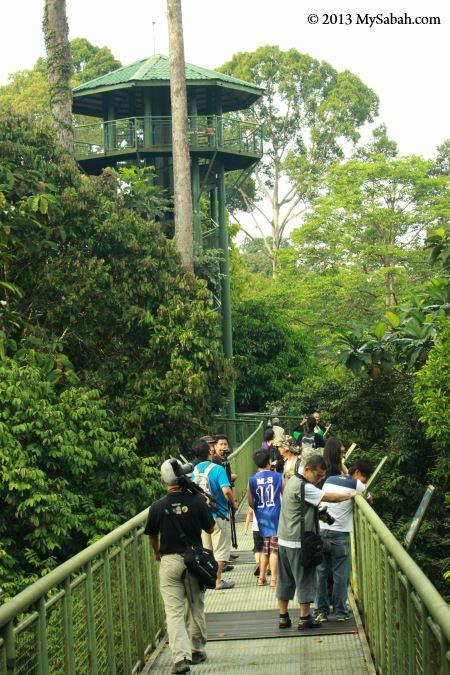 Pic: the canopy walkway of RDC, at the end is the Bornean Bristlehead Tower, the best location to see this superstar bird of Borneo. There are about 307 bird species in this area too. Bornean Bristlehead is generally scarce but locally common resident. You need some luck to see it. 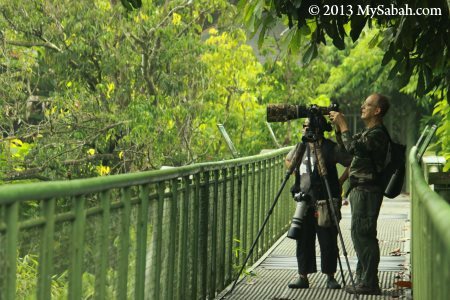 Some bird watchers can spend hours waiting for Bornean Bristlehead on this canopy walk. 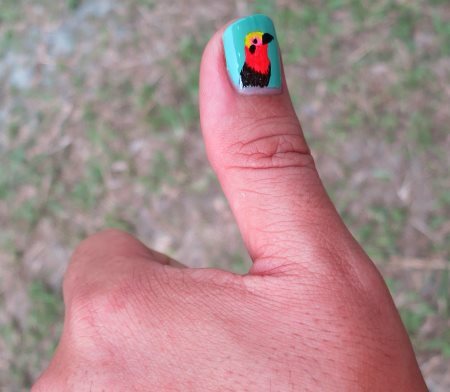 Sadly, for my first 2 days in Sepilok, I didn’t see it, though a few birders had spotted it and shared its photo on Facebook. 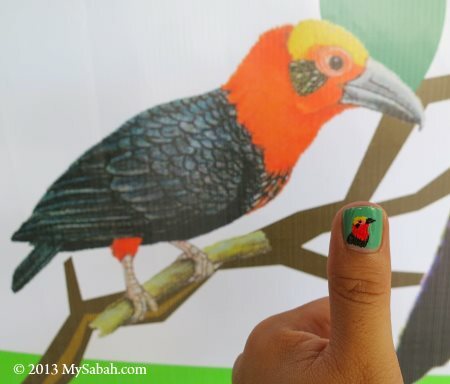 Well, just for fun, I got Bornean Bristlehead painted on my thumbnail, so I could see it every day, LOL. 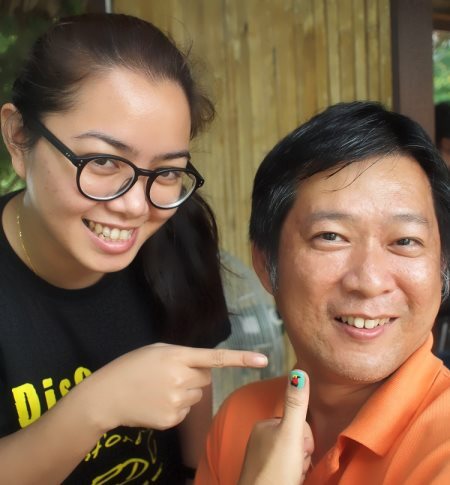 I was the only guy who tried the nail painting there, haha. You have to believe in the Law of Attraction. If you keep thinking about one thing, no matter it is good or bad, it will come to you. 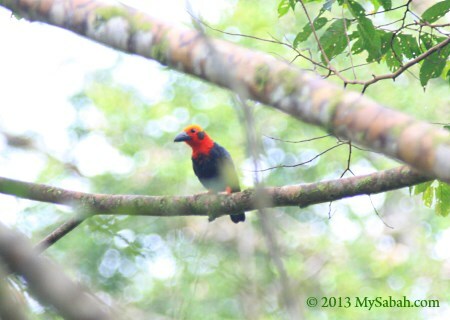 In my last day in Sandakan, some birders told me that they saw Bornean Bristlehead in forest nearby. When I rushed to the site, there were already a group of birders and photographers waiting for the bird. 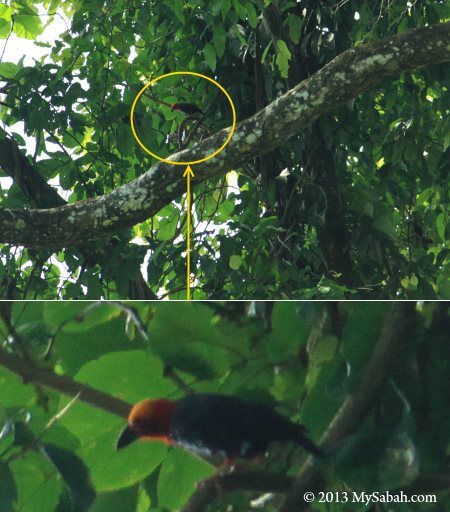 In a few minutes, a Bornean Bristlehead showed up on a tree about 15 Metres away from us. It is a fairly active and vocal bird and looks like a crow with head on fire. It was hopping from branch to branch for nearly a minute, until an approaching group of noisy students scared it away. Anyway, I was really happy and took a few photos of this superstar. Please pardon about the poor photo quality, as I didn’t have a bazooka lens like below. Pic: 800mm lens of Canon, which costs about RM56,000 (about USD17,500)!!! Would you buy a car or this lens? 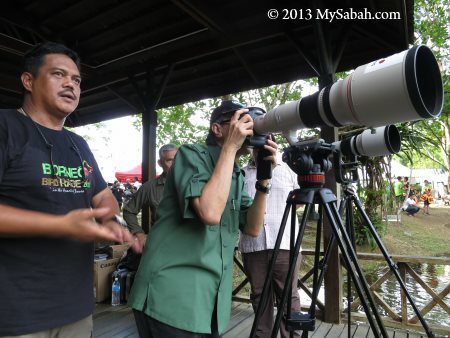 You just need the most expensive best lens for bird photography. Besides RDC in Sandakan, another best place to see Bornean Bristlehead is at canopy walk of Danum Valley in Lahad Datu. I saw it again last week, and it was only 10 Metres from me this time. Better photo huh? Bornean Bristlehead likes to perch on branches under big leaves, where it can find insects. Yay! 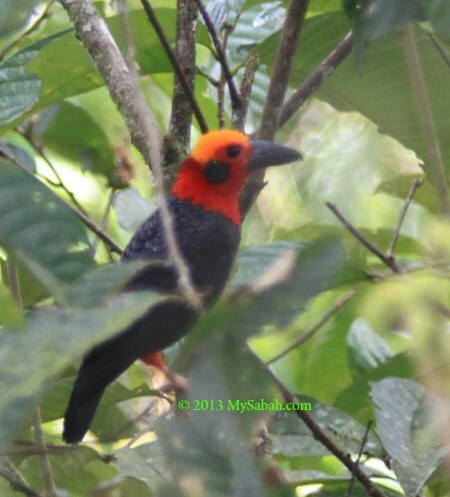 Bornean Bristlehead rocks! 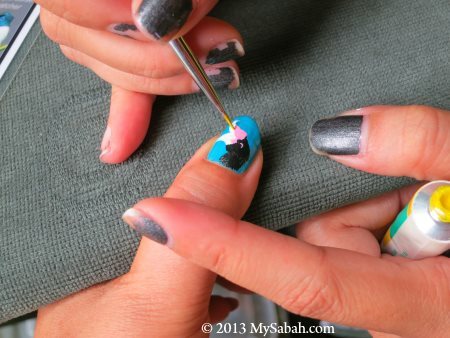 What is your favorite bird?